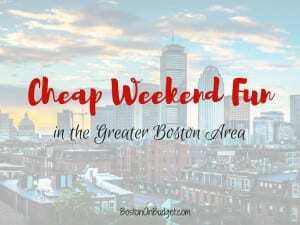 Cheap Weekend Fun in Boston for August 11-12, 2018! There’s so many fun and cheap things to do this weekend in Boston and beyond. This weekend is also tax-free weekend in Massachusetts so you won’t have to pay sales tax on most purchases as long as they are under $2,500. As a deal lover, I must remind you that this is only a 6% discount and you’ll tend to find better discounts and sales on other weeks. However, it is a great weekend to buy things that never go on sale. We used to buy all our lumber for our house projects on this weekend because it’s something we’d buy at full price often. Madonna Della Cava Feast: August 10-12, 2018 in the North End. Enjoy this annual feast in the North End this weekend! 18th Annual GospelFest: Sunday, August 12, 2018 from 5-8PM at City Hall Plaza. Enjoy New England’s largest Gospel festival and is free and open to all! August Moon Festival: Sunday, August 12, 2018 from 10-5PM. Enjoy a day of music, martial arts, food, arts and crafts, and much more! Out of the Park: Saturday, August 11, 2018 at Boston Common starting at 2:30PM. Celebrate the excitement of Fenway Park at Boston Common this Saturday when the Red Sox take on the Yankees! Free with many free activities! D Street Market: Saturday, August 11, 2018. Enjoy a European-style street market with live music, mini classic car show, kid activities, and more! Magic 106.7 Family Film Festival: Every Saturday from July 7-August 25, 2018 starting at 6PM. Enjoy a free movie under the stars in the courtyard of the Prudential Center with a free screening of Mulan starting at dusk. Movies in the Park: Every Saturday from July 7-August 25, 2018 at Sylvester Baxter Park in Somerville. Head to Assembly Row for a free outdoor movie with a free screening of Coco starting at dusk. Sunday Night Movie Night: Every Sunday night from July 22-August 26, 2018 at Christopher Columbus Park in the North End. Enjoy a free outdoor movie screening of Mary Poppins at dusk.